the Terrace Gardens were all more accessible. During the winter of 1834 Mr. Hall had a large number of 'very expensive trees' planted in the gardens. Unfortunately these are not named but there are several large and unusual trees in the cemetery today, two magnificent copper beeches and a holm oak for example, which may be survivors of Mr. Hall's planting scheme. 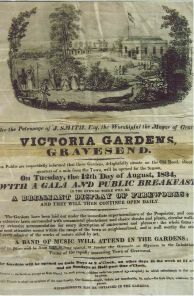 In November 1837, due to the gardens being less profitable than hoped, Mr. Hall decided to turn the Victoria Gardens into a cemetery. At the time there was a boom in setting up new cemeteries owned and managed by joint-stock companies. 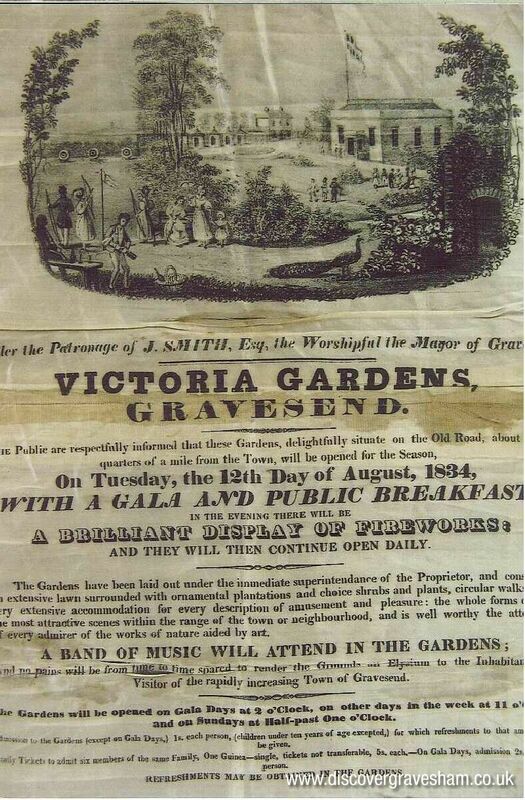 Such a company was set up by Mr. Hall and some London speculators and called the 'Gravesend & Milton Cemetery Company'. 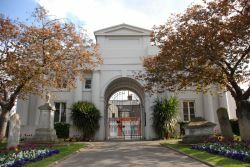 During 1838 an architect called Stephen Geary was employed by the company to build an ornamental entrance lodge and catacombs for the new cemetery. His brief was to surround it by a high brick wall and alter the Concert Room into two chapels, one for the Anglicans and one for the Dissenters. Stephen Geary was the architect who designed the famous Highgate Cemetery in 1836-37. Fortunately, Stephen Geary seems to have left the ground plan of the Victoria Gardens more or less intact. However, circles and curved paths do not fit well with rectangular graves and in his original plans of 1838 which are preserved at the cemetery, it is clear that in places he has straightened original paths or buried across them. It seems that later still more straight paths were laid and in parts of the cemetery the original curve of a path can only be detected by the alignment of the gravestones. He designed a massive range of catacombs designed to take 500 coffins but they were costing too much money so the Board stopped the work. There are some burials in the catacombs but this was officially stopped in 1938 although there had not been burials in there for some time. The first burial in the cemetery took place in 1839 in a common grave and a piece of London Bridge is supposed to be placed on top of this grave. The original cemetery company was declared bankrupt in 1847 but the cemetery continued in private ownership until 1905 when it was acquired by Gravesend Corporation. The cemetery was extended in 1926 into the small triangular area beyond the catacombs. In 1931 the 'B' section was created and further extensions were done in 1948. Other extensions have been carried out since.